Last weekend, a group of South African tweens and teens in bright green T-shirts exited LAX’s international terminal, formed several loose rows, and began to sing. It was a moment of pure joy in an environment that typically breeds frustration—a moment seven years and 10,000 miles in the making. Earlier this week, ACC founder Sue Fink was battling a cold, but couldn’t contain her enthusiasm about having the kids in town. Since their arrival, they’ve had a picnic at the beach, sang at Holman Methodist Church, checked out the California Science Center and USC, and visited Disneyland. All in between rehearsals with the ACC. Fink founded the ACC at McCabe’s Guitar Shop in Santa Monica in 1993. Back then it had 18 members; 25 years later, it has in its ranks 160 singers of various ages and from a variety of backgrounds. So far, it’s been an eventful 25th anniversary year. Besides hosting the visiting choir, the ACC was chosen to appear on America’s Got Talent (the episode or episodes—they can’t say—should air sometime this month). And they’re still riding a wave of internet fame. Their rendition of Toto’s 1982 hit “Africa” has upward of 10 million views on their YouTube channel alone. Despite the sheer size of the group, the ACC still selects its repertoire via democratic process. That dedication to making music-making a collaborative process has bred a “cohesiveness” Fink says she’s seldom seen or experienced in other groups. And it’s not in spite of the group’s diversity—it’s because of it. This weekend program includes a rendition of “A Thousand Beautiful Things” by Annie Lennox, “Samba Do Avião” by Antônio Carlos Jobim, and a brand new work by Grammy Award-winner Christopher Tin. And Toto too. 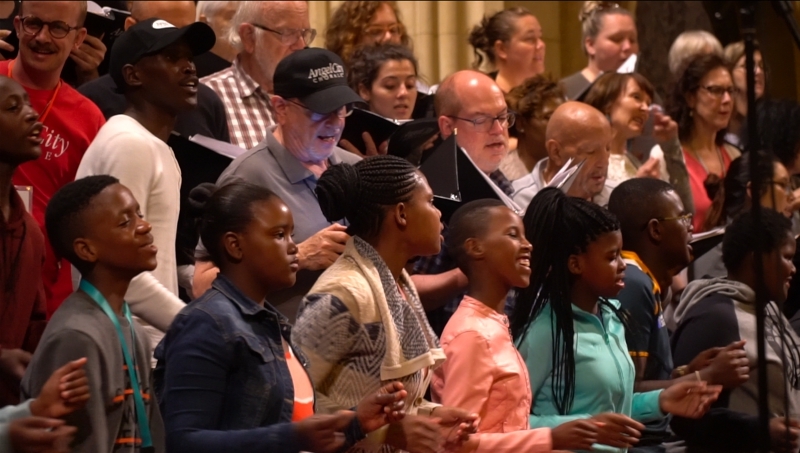 “One World, Many Voices 2,” Immanuel Presbyterian Church, 3300 Wilshire Blvd., Koreatown; Sat., June 2 and Sun., June 3, 7 p.m.
Next articleThe Hammer Museum Is Tapping Into Local Talent with Made in L.A.